I've moved on from bees to bacteria, oh how I've progressed. Also, no more snow, hurrah! I finished watching Honey and Clover yesterday. Such a good series! I really enjoyed it. I think that what made it good was that all the characters were likeable. Incedentally, I don't think I'm really enjoying Paradise Kiss because I don't like the characters. Anyway, as good as it was, I do feel a little empty handed. I need closure! What happens to everyone?! Am I really going to have to read the manga to find out? Hmmm, I hope everything goes well for Takemoto bless him, he's adorable. I'm also getting into Fruits Basket volume 6 at the moment. Awww, poor Kyo! Don't talk to me about bees. No, really. Currently: Should I try to explain the damp patch on my jumper and how it got there, or just try to dry it with a hairdryer before too many people see me? Supposedly: I should be writing my seminar. About bees. My seminar about bees. Why am I giving seminar about bees? I can't possibly do any work when I have a soggy jumper. 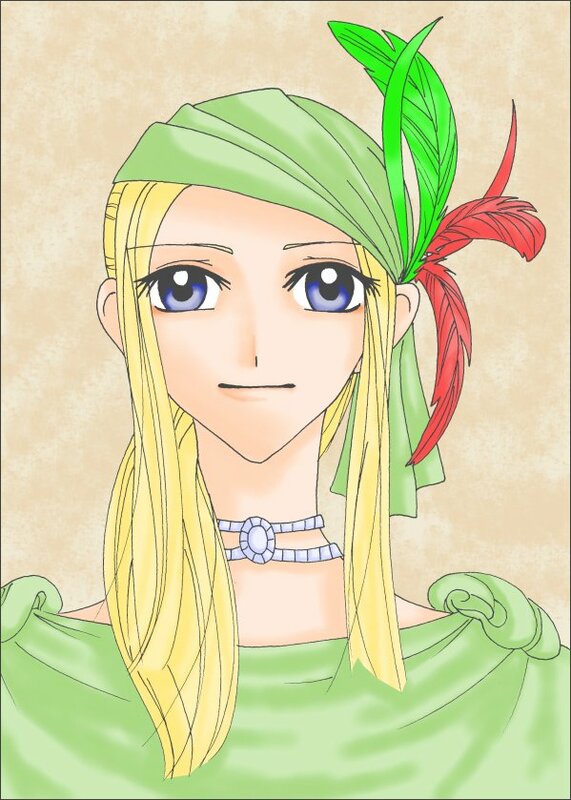 And: I'm downloading Paradise Kiss episode 6. I'm still not sure why I continue to download it. But it has Franz Ferdinand singing the ending song! Therefore the plot has to get interesting soon! Hrrrmmm. I've been meaning to write in here for days, but I've been a little busy with writing presentations or procrastinating from writing presentations. It has also been really really cold. I've spent the whole weekend huddled in a blanket (the radiator in my room is too small!). Have another page of clematis why don't you. My Gogol Bordello album came through the post yesterday! It is very energetic. I should be careful, I'll get worn out if I listen to it too much. Watched The Life of Brian yesterday. Possibly the funniest film I've ever seen, ever. And today's topic of study is, learning and memory in african honey bees. All change please. All change. The new layout is up! Surprisingly, it didn't take me as long as I thought it would. In fact, most of the time was taken up by eating pizza and then having a little nap in front of Star Wars episode 4. Hmmm, what can I say? I drew the layout picture especially, you can see a full version of the picture here. Yup it's Chloe, I really should put this picture in the gallery on my webcomic page, and I will, once I've actually drawn some more of my comic. The big plan was to make the picture, the colouring at least, in the style of a cross between Mucha and Kouga Yun. I don't think that really happened, but never mind. As nice as they are, I'm just glad that I don't have to stare at Franz Ferdinand any longer, I was getting quite bored of that layout. I've been extremely lazy with my uni work this week, but I don't seem that worried, hmm. I tried to buy a CD today. I've been listening to Gogol Bordello non-stop for the past two days; it's crazy energetic stuff. Sadly, no shops had their new album, so I've had to order it from Amazon *sigh* waiting is so hard sometimes. We went out to the new club in town yesterday. Mike is in town for a couple of weeks so he came with us too; it was nice, just like in the old days. The club had possibly the smallest dancefloor ever. The room was tiny and they'd filled half of that with seating! Now don't get me wrong, I like to have somewhere to sit down, but there was actually plenty of seating already! Ah well. Now, I'm going to try and give this site a new layout. Whoot! So, um...it may look a bit messy for a while, I apologise. I haven't seen it rain this much since I was in New York. And oh how it rains! 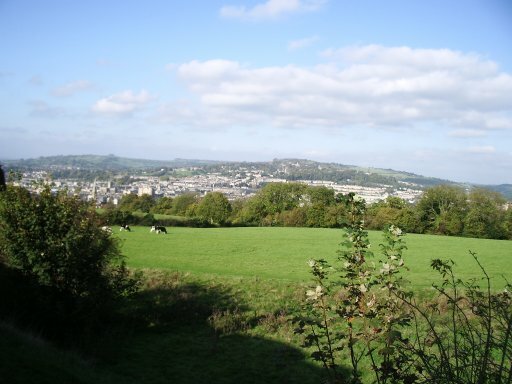 I had to walk down a hill, water also likes to go down hills, it felt like I was walking in a stream, it really did. 'Soaked to the bone' would be an apt phrase to use. Oh, now I regret going back up to uni for that optional seminar, that I do. As it is, I had a nice weekend at home with my parents, not doing much bar reading up on local history. I also finished reading Samuel Pepys, and what a note of dispair the diary finishes in, poor guy. That in turn means that I was able to begin reading Anna Karenin. I'm quite excited about that, I've never read any Tolstoy before. It seems good so far, the story is engaging and I quite like the way he writes, everyone seems so animated, it's quite nice. The other thing of note is that I watched the League of Gentlemen's Apocalypse yesterday. Sadly it wasn't as funny as it could have been (some of the humour seemed to have been replaced with action and plot) but it was by no means bad. I want a watch like Tubbs' one. You know, the opening song from Paradise Kiss is growing on me. So after fighting with comicgenesis' new site admin for a full quarter of an hour, I finally managed to update Clematis. I have been very busy up until Wednesday. I have now finished and handed in my placement report and given my first seminar (scary). To celebrate the finishing of work, we went to see Nanny McPhee. It was OK, but I was very much expecting her to fly off with an umbrella at the end. On Monday, I saw a van. 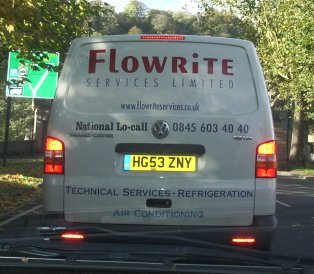 A van with a certain name on it. And as I am a loser, I had to take a photo of it. Got too much work to do and not enough time to do it. You know when someone puts an iron to your head and tries to steam you into the craggy tarmac of a disused car park? It kinda feels a bit like that. But! Hopefully it'll get better once today is over, I will finish the report today, I will. I had completely forgotten that I had this photo. 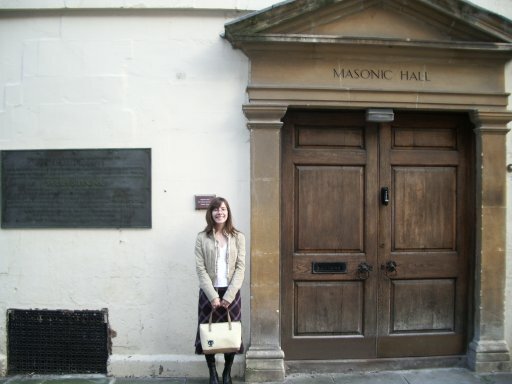 A few weeks ago I finally found the masonic hall in town, and so I had to have my photo taken next to it. Why I find freemasons so fascinating is still beyond me. I see this view every time I walk home from campus. Today it was particularly beautiful (and there were cows) so I wanted to share it. And this is why I adore living in this place. Although this was filler, it wasn't too bad as things go (although it would still have been better if they ended the series at the previous episode without bothering with the filler, it was exciting enough as it is). Yum yum yum Amazon hmm? Har! I've just bought some books from Amazon. I got for myself: xxxHolic volume 6 (because it was released today), X/1999 volumes 10 and 11 and Fruits Basket volumes 5 and 6. I'm going to have lots of manga to read in 7-14 days time. I don't know when I'll get time to read it all though. I looked over to where they were and saw nigh on 10 people, all dressed as Jimmy Saville. It was very funny, probably one of the best ideas for a dress up theme I've seen in a good while. They were chanting while on the bus too, it all felt very British, I'm not sure if much drunken chanting goes on in other countries, but it made me feel at home. And then in the club, not only did they play Franz Ferdinand, which is bound to make any night out a good one, but they played the Arctic Monkeys! That's a first! I was very happy to hear that. Ah, I bet you look good on the dancefloor, dancing to electropop like a robot from 1984. Today I went for a little bit of shopping. I got some long flapper style pearls for myself, which is nice. I also got myself the new album from We Are Scientists! I'm not sure how good it is yet, but it's got one of the cutest covers I've seen. Aww, little kittens! While buying the CD I happened to come across the DVD of the League of Gentlemen's Apocalypse. I had to buy this film, I love the League of Gentlemen, but I never saw their film when it came out because I was, well, in the wrong country at the time. So I shall watch that sometime, hopefully it'll be as funny as the TV series was. Sometimes you go to a careers fair and get a bit worried that the only jobs that you are supposed to do involve working for some company with a hard to pronounce name, which is as equally bland as it is high profile, and doing some generic job, which is advertised as challenging but probably involves a daily handful of ennui in front of a computer screen that you will come to hate with time, while you fret over your mounting disatisfaction but have no will to do anything about it. Arrrrgh! Are we supposed to be excited about searching for a career? Because I find myself decidedly lacking in that department. Also, why am I so cynical today? It's not right. On a related theme, I saw Honey and Clover #12 today. It's breaking my heart, it really is. Midori drew me some Clematis fanart!